Everyone needs a vacation every now and then, including owners of WordPress websites. However, what happens to your site while you are away? After all, the Internet never closes. If you’re feeling like you can’t take time off for fear of having your site or business collapse, be unafraid. WordPress offers plenty of tools to prepare it for your absence. Whether it’s the holiday season or you’re going to a tropical island, with some preparation your site will be able to spend time without you and be fine. In the following, we will cover how to keep your site running, even if you are not there to take care of it. The article will cover things like outsourcing and automation to keep your site busy, safe and up to date. Follow the steps below and you can go on vacation without anyone even noticing you are gone. Of course, one of the easiest ways to deal with being away is to have other people take over your work. Here are a few possibilities to make that happen. If you are part of a team, you can simply delegate the necessary jobs to others. This includes client sites, where clients are willing to take on some more responsibility while you are out of the country. For both cases, the User Role Editor plugin is your friend. It allows you to configure exactly who can do what on any given WordPress site. This way, you are able to give access to team members and other people only to those areas you want them to be able to control. Doing so reduces the chance of accidents and also allows you to take back control easily after your return. If you are fortunate enough to have other people assume some of your work, it’s also a good idea to give them all the help they can get. Sure, going over the tasks beforehand is nice, however, new questions can always come up and people can simply forget their instructions. For that reason, it might be a better idea to create solid documentation on all website processes. An excellent plugin to make this happen is Simple Documentation. It allows you to leave helpful information inside the WordPress backend in the form of links, videos, notes, and files. A popular alternative, that hasn’t been updated in a while is WP Help. Finally, if you have the money to spend, you can also hire help to take care of your site. By now, there are several companies who specialize in WordPress site administration and maintenance. Examples include WP Curve, WP Site Care, and WP Buffs. But there are more out there. Aside from that, you can also simply outsource parts of your work such as content writing. This allows you to prepare material for the time you are away quicker to fill your content calendar. More on that below. When going out of the country, it’s customary to set an “out of office” notification for your emails. However, as a website owner, chances are good that you have another form of communication to deal with: contact forms. Especially if you do client work, it’s a good idea to let anyone inquiring about your services know that you are currently not reachable. That way, you will make a professional first impression even if you can’t talk to them personally. Let them know that you are not around but that you are grateful for their message and will get back to them upon return. You can find a tutorial on how to implement an autoresponder in Contact Form 7 here. If you are using a different form, Google for specific solutions for your use case. Content is at the heart and center of every WordPress blog. For that reason, one of the most important things is to keep the content machine running while you are lounging in your beach chair. In case you are not aware, WordPress comes with a built-in feature to schedule your posts’ publishing days ahead of time. That way, your site will push out the latest blog article without you having to be around to hit the Publish button. Here’s how to do it: Once your post is finished, go to the Document options in the upper right corner. Click on the date link where it says Publish. 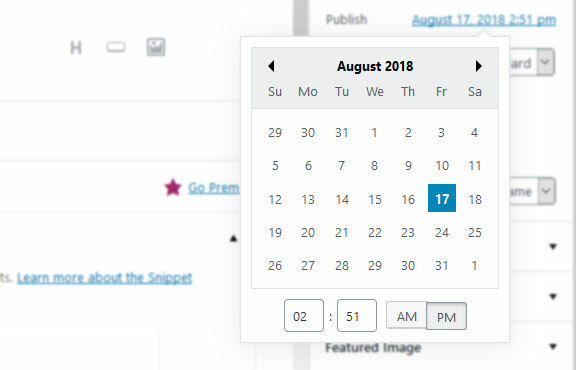 This will open a calendar where you can pick a date and time at which you want the blog post to appear. When you do so, the Publish button changes to Schedule. Once you click it, the post is in the pipeline and your site will automatically publish it when the time comes. Alternatively, you can use plugins like Editorial Calendar and CoSchedule to schedule your posts. Both of them let you do so via drag and drop. They can also help with collaborating with others if you are part of a team. In either case, double check your posts for completion since you won’t be there when they go out. Jetpack — The publicize module of Automattic’s plugin suite lets you connect your site with social accounts. That way, when a new post goes out (that you scheduled beforehand, of course), it will also automatically hit those channels. Easy peasy. Revive Old Posts — In addition to that, you have this plugin to publish older articles to social in regular intervals. It’s great to give your evergreen content a well-deserved go around and remind your audience of other things you have published, not just when you are on vacation. Aside from that, I can recommend Buffer to automate the rest of your social marketing. The aforementioned CoSchedule plugin also has capabilities like that. Don’t Forget Your Email Subscribers! Your email list is one of your most important marketing tools. People who subscribe to your newsletter are usually among your most engaged followers. Therefore, it’s important to keep them in the loop, even when you are away. Thankfully, all email marketing services worth their salt (such as MailChimp) offer the ability to schedule newsletters in advance. Prepare an email blast for any content coming out while you’re on vacation and rest easy knowing that your subscribers will hear about it even if you’re not there to send it personally. Of course, the last thing you want to worry about when sitting poolside is updating your site. However, keeping up with the latest versions of core, themes, and plugins is important, not least for security reasons. Thankfully, since version 3.7, WordPress automatically installs minor updates. This way you always get the latest bugfixes and safety improvements for your site. So, unless you have switched this off manually, there’s no need to do anything about it. However, can also enable the same for major updates, plugins, and themes. You are able to do this manually as well or use a plugin like Easy Updates Manager. The plugin gives you full control over everything related to updating your WordPress website. Determine what gets updated under which conditions and who has the authority to make update-related changes. Disclaimer: Updating your site always involves at least some risk of something going wrong. This is especially true if you are using a lot of plugins that are not well maintained. For that reason, you need to weigh the pros and cons of enabling automatic updates. It might be enough to simply switch on security updates for the time of your absence and invest in other security measures. However, security is doubly important when you are not involved in the day to day since it might take some time for you to notice that something is off. First of all, should make sure to have a good baseline when it comes to security. For that, it makes sense to install a WordPress security plugin and refer to the posts above to make your site as secure as possible. Be sure to recheck your current security system before leaving. While you are at it, check that your security solution is GDPR ready if that applies to you (it probably does). There are some concerns in that area. Also, don’t forget to have a reliable anti-spam plugin in place. Spambots don’t sleep. Without a defense in place, you will come back after vacation and have to slog of hundreds or thousands of spam comments to find the legitimate ones. My personal recommendation here is Anti-spam Bee for a free solution but there is also the almighty Akismet and other solutions. Your second line of defense to keep website horror stories at bay is having a backup solution in place. There are plenty of options out there, including free plugins that allow automatic remote backups. Again, make sure your system is running and also back up your site manually before you leave. That way, you can be sure you have a working version at hand, should push come to shove. If possible, use a backup solution that makes it easy to roll back to an earlier version of your site. You can only fix a problem if you know it exists. For that reason, to keep your site online while on vacation, you need to make sure you have a system in place that alerts you to any issues. Many of the aforementioned security plugins come with options to notify you of any potential issues. However, what if your site vanishes from the web completely? In that case, the security plugin that was supposed to ring the alarm might have gone down with the ship. If you already have Jetpack installed on your site, you can take advantage of their downtime monitoring service. There are also external resources like Uptime Robot. Both are free to use, will ping your site in regular intervals and let you know if they come up empty. While that’s not a message you want to receive on vacation, it’s better than coming home and seeing your site has been offline for days or weeks. Vacations should be about relaxing, sightseeing and taking a timeout. The last thing you want to be doing is to have one eye on the margarita in front of you and one on your laptop screen. Preparation allows your site to run along smoothly while you take your well-deserved break. The advice above is aimed at just that. It will keep your audience informed and fed with content, your social channels busy and your site up to date, secure and backed up. By automating the most important parts of your online business, you can finally sit back, relax and make some memories. Have fun and don’t forget to send us a postcard! How do you prepare your WordPress site for a vacation? Any additional tips or tools to share? Please do so in the comments section below.